Philly Pressbox originally published this article on January 30, 2012. We’ve been asked to republish it several times by our readers so here it is. We hope you enjoy it. Feel free to comment. With the passing of Penn State legendary coach Joe Paterno this week it was somewhat lost in the news of the passing of a Philadelphia legend Andy Musser. Musser was often below the radar in the Phillies broadcast booth from 1976 – 2001that was full of larger than life personalities but Andy was a true professional, a gentleman and a man that could broadcast any sport and do a great job of it. Many people know Andy from those Phillies years but he also broadcasted the Eagles from 1965-68 and the 76ers from 1965-71. That’s 34 Philadelphia sports season in the books for Andy. Great Job!! Andy’s passing made me think about the broadcasters that we’ve had in Philadelphia over the years. Do you realize that if you were born after 1955 you had never heard a Phillies game that was not broadcasted by a Hall of Famer? 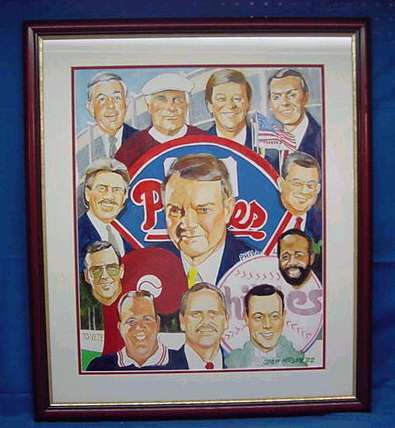 When I first started watching and listening to Phillies baseball it was Bill Campbell, Rich Ashburn and By Saam. All are HOF members in their own way. Campbell as a broadcaster in the Basketball HOF, Ashburn as a player in the Baseball HOF and the legendary By Saam as a broadcaster in the Baseball HOF. 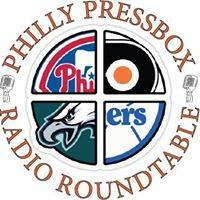 Saam called Phillies games from 1939-49 and again from 1955-1975. Campbell was replaced by Harry Kalas and another 38 years of broadcasting from a Baseball HOF member. Add to that the one year stints of Hall of Fame players Robin Roberts in ’76 and Mike Schmidt in ’90 and “The Box” was loaded with All Stars. Another long time member of “The Box” is Chris Wheeler who just completed his 34th season with the Phillies as well as Musser and his 25 years. Moving on to the Flyers, people my age learned the game of hockey by Hall Of Famer Gene Hart. 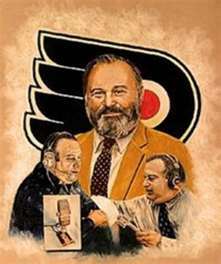 Hart was a Flyers broadcaster the initial 67-68 season and then full time from 1971-1992. Who will ever forget Gene calling the games of the Broad Street Bullies and the Stanley Cups? The Hart legacy lives in with his daughter Lauren singing the National Anthem and God Bless America at all home games. Here’s an interesting Flyer broadcast fact for you, during the 1970-71 season Flyers Sunday games were broadcast by former Phillies 1st baseman and later National League Commissioner Bill White. White was the first black to announce an NHL game. The Chief, Bobby Taylor spent 16 seasons, Gary Dornhoefer 14 and now Jim Jackson has been bringing us games since 1993. Maybe HOF will be in JJ’s future one day. The Eagles Merrill Reese, although not a Hall of Famer at this time, has been broadcasting games on radio since 1977 and does he do a great job? How many of you have turned down the TV to listen to Merrill do the play-by-play along with his many color commentators, Herb Adderly, yes the HOF player, Bill Bergey, Stan Walters and now Mike Quick call the game the way it should be called. Tracing way back to 1940 By Saam was doing the games up until 1955, minus the 50 and 51 seasons when Bill Campbell took over. Campbell called the games until 1964. In ‘64 Saam was back for one last year working with Campbell and former Eagle Tom Brookshier. Musser took over from 1965–1968. Charlie Swift covered from 1969-77 and Reese joined Swift in 1977 until now. What a run of great announcers! Did you know that future Baseball HOF broadcaster Jack Buck did Eagles games in 1961? Anyone who was able to go to games at Franklin Field and the early days at The Vet will never forget the booming voice of PA announcer Matt Goukas Sr. who handled the duties from 1953-1985. Goukas was legendary! His call of 2nd down and niooooooon (2nd & 9) is still in my head after all this years. Amazingly enough when Goukas retired Dan Baker took over and he has been the PA voice of the Eagles ever since not to mention handing the same duties with the Phillies since 1972 and doing Big 5 basketball from 1977-1989. Baker has been a busy man in Philadelphia. Speaking of PA announcers we can’t forget “The Zink”, Dave Zinkoff. Zink was with the Philadelphia Warriors and then the 76ers from 1946-1985. Zink had many favorites but “Dipper Dunk” for Wilt Chamberlain, Julius Errrrrrrrrrrving and Moses Maaaaaaaaaaalone have to be at the top of the list. Of course we can’t forget Bill Campbell again. Campbell along with his work with the Eagles and Phillies called Warriors games from 1946–1962 and 76ers games from 1972-1981. Andy Musser followed and Mark Zumoff has been holding it down since 1994. There can’t be another city that can say that they’ve had a run with broadcasters and announcers that Philly has had. From Saam to Campbell to Ashburn to Kalas to Musser to Hart to Goukas to Zinkoff to Baker to the present day guys of Reese, Wheeler, Zumoff and Jackson it’s been quite a run. The bar has been set very high. As Gene Hart would say, “Good Night and Good Hockey”!! !